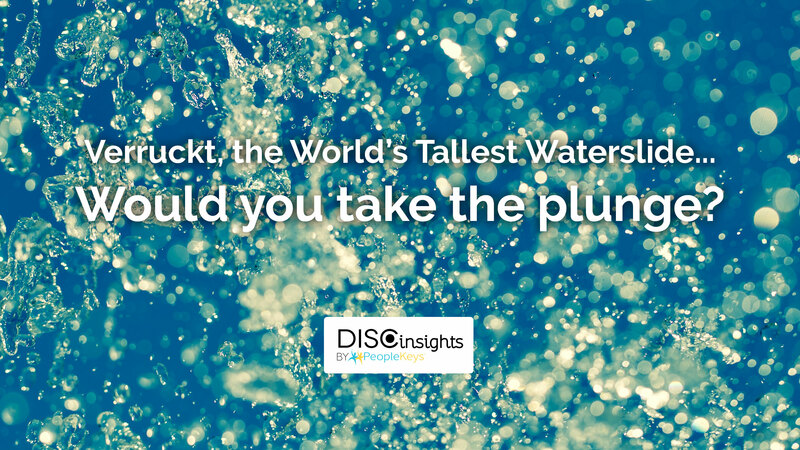 Verruckt, the World’s Tallest Waterslide: Would You Take the Plunge? Verruckt is taller than the Statue of Liberty. Verruckt is higher than Niagara Falls. 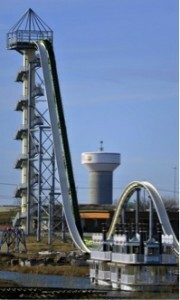 In April, it was certified by the Guinness Book of World Records as the tallest water slide in the entire world. The raft is launched into the air after the first drop, and the sandbag “passengers” plummet with a SMACK to the ground below. Verruckt is aptly named. In German, the name means ”crazy.” A fitting name, indeed. To ride it, passengers have to climb 17 stories to the top of a narrow platform. Three riders are then strapped into a bobsled-style raft using belts across the waist and shoulders. The wait until the launch is probably the hardest part—once riders are off, though, they experience a drop of over 168 feet, hitting a top speed of nearly 65 miles per hour. Powerful water jets add speed, as the slide careens over the initial drop and back onto a second 50-foot “camelback” hill. “It’s like jumping off the Empire State Building,” said one rider. So, what do you think? Would you ride Verruckt or chicken out? Your personality type might offer a clue. People with a D Personality Type are risk-takers by nature, so it’s definitely possible that the Verruckt would be appealing. Never one to back down from a new challenge, D personalities like to push themselves to the limits just to prove that they can. And because of their competitive nature, if a D knew someone else that had ridden the slide, they would be compelled to rise to the other person’s challenge. The biggest reason for hesitation a D personality would feel, though, would be tied to their drive to always be in charge. A ride on a slide as death-defying as Verruckt would force them to put a lot of faith into the park’s engineering team, and the feeling of surrender might be more than some can handle. But then again, the sense of freedom and welcome break for the norm that comes from a ride like that would probably be enough to silence those fears. Personality Type I: Heck yeah! People with an I personality are fun, outgoing, and exuberant. Daredevils, even. The sheer fun factor of the ride alone would be enough to get them to make the climb. Anything for a little fun. And if they can do it with friends, all the better. I personalities tend to be optimistic and don’t dwell too much on the negative. They wouldn’t be likely to obsess over all of the possible disaster scenarios. Also, one of the primary things that motivates I personalities is the approval or acceptance of others. Even if the I was thinking about chickening out on the ride, the thought of being teased by their friends would likely force any doubts out of their minds. Plus, the fuss everyone would make over them at the end of the ride would be too enjoyable to resist. Personality Type S: No way. No chance. No how. Of all the personality types, the S personality style would be the least inclined to throw themselves off a 17 story drop. The things an S values the most are safety, security, and stability. The Verruckt is pretty much the opposite of that in every conceivable way. To most S personality types, it just wouldn’t be worth the risk. Personality Type C: Wait and see. But C personalities don’t like leaving much to chance. They would have to do research on the safety of the slide before deciding to try it out and would need to wait to see more people go down the ride successfully before making up their mind. Right now the calculated risk would be too high. I mean, did you see those sandbags fly off the track?? Someone’s not doing their math right. No matter what your personality, this much is true: If you dare to take the plunge off Verruckt, it’s bound to be the most terrifying 18 seconds of your life. Anyone that rides it is slightly insane.